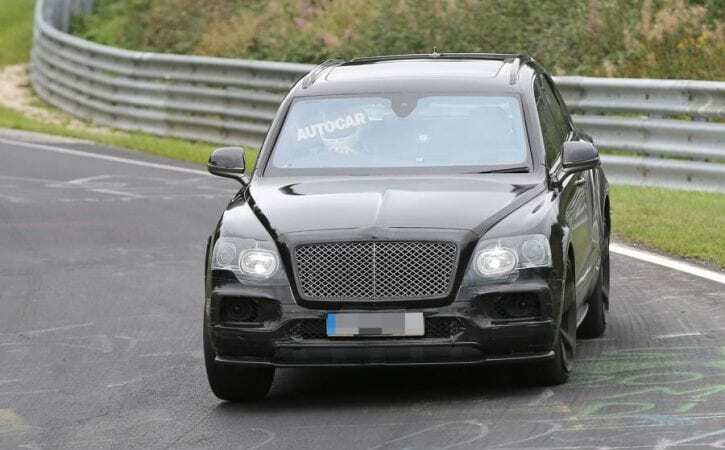 Bentley is preparing a high-performance version of its forthcoming Bentayga, judging by these spy pictures of a more extreme version of the company’s first SUV. Bentley has already released a teaser video for the Bentayga, ahead of the car’s public debut at September’s Frankfurt motor show. The footage was shot during high-altitude off-road testing in Spain. It shows the car undergoing low-speed manoeuvres on rocky terrain – although the test mule does not appear to have shed any of the mild disguise that remained in the most recent spy shots. You can watch the video below. Those spy pictures, taken during hot weather testing in Death Valley, showed the car with a less disguised front. The round headlights were still camouflaged but the rest of the front was totally undisguised. These pictures were the first time that all air intakes in the front bumper were on show.